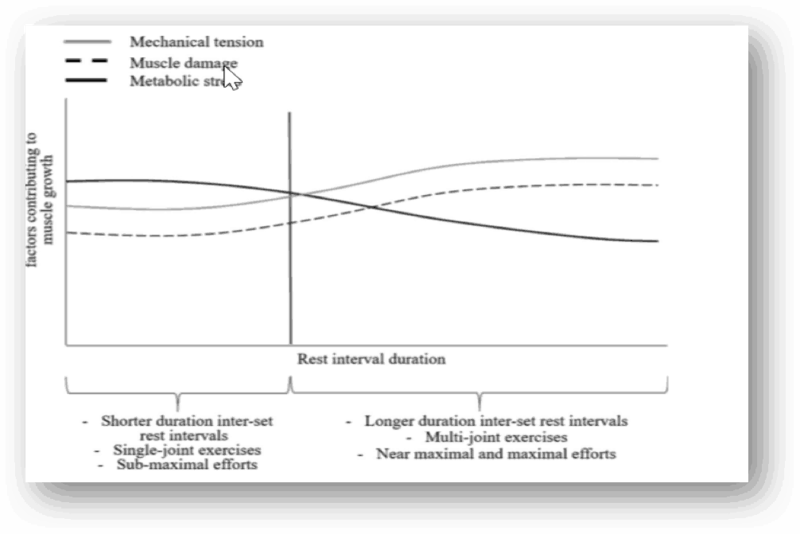 Mechanical Tension – Considered to be the primary mechanism responsible for the growth of lean muscle mass. Mechanical tension is the force you place on your muscles under when you contract them against resistance. For example, mechanical tension increases with the amount of weight the muscle is exposed to or it can increase over the duration of a higher repetition set, progressively muscle fibres fatigue as the length of the set continues, so by the time the muscle fatigues, a large majority of the muscle fibres in the target muscle have been exposed to sufficient mechanical tension needed to drive increases in muscle growth. Metabolic Stress – Traditionally, body builders have used a number of advanced overload techniques such as drop sets, strips sets and compound sets; to expose their muscles to metabolic stress (think the burn). More recently, blood occlusion studies have shown a link between muscle metabolite accumulation and increases in muscle mass. Muscle Damage – Muscle damage is the third mechanism researchers believe is responsible for increases in lean muscle mass. Historically, eccentric training has been used to increase microtrauma to the muscle fibres, which after sufficient rest, the damaged muscle fibres are repaired and through this repair process increase in size. However, whilst a little muscle damage is possibly good for muscle growth, excessive muscle damage is not. As demonstrated in the graph below, these three proposed hypertrophy mechanisms most likely occur not in isolation, but rather in unison. For example, during a high repetition set to fatigue, the target muscle fibres will experience a gradual rise in metabolic tension, as more and more muscle fibres are recruited to power the necessary contractions, whilst at the same time, more and more metabolites will accumulate as the muscle becomes progressively fatigued and by the time the muscle is fatigued, there will be most likely some degree of muscle damage. Fisher, J., Steele, J., & Smith, D. (2013). EVIDENCE-BASED RESISTANCE TRAINING RECOMMENDATIONS FOR MUSCULAR HYPERTROPHY. Medicina Sportiva, 17(4). Helms, E. R., Fitschen, P. J., Aragon, A. A., Cronin, J., & Schoenfeld, B. J. (2015). Recommendations for natural bodybuilding contest preparation: resistance and cardiovascular training. Heavy VS Light Weights Pt 3 – Wednesday WisdomHow long until I can see my abs coach?